Tell the truth, who has already started decorating for Christmas? I’ll admit it, I have started. My mantle is already decorated and I’m loving how it turned out this year. I’ve been eyeing all of the beautiful white and silver decor that’s been popping up the last couple of years and finally decided to take the plunge and go white and silver on my mantle, and I love how it all came together. 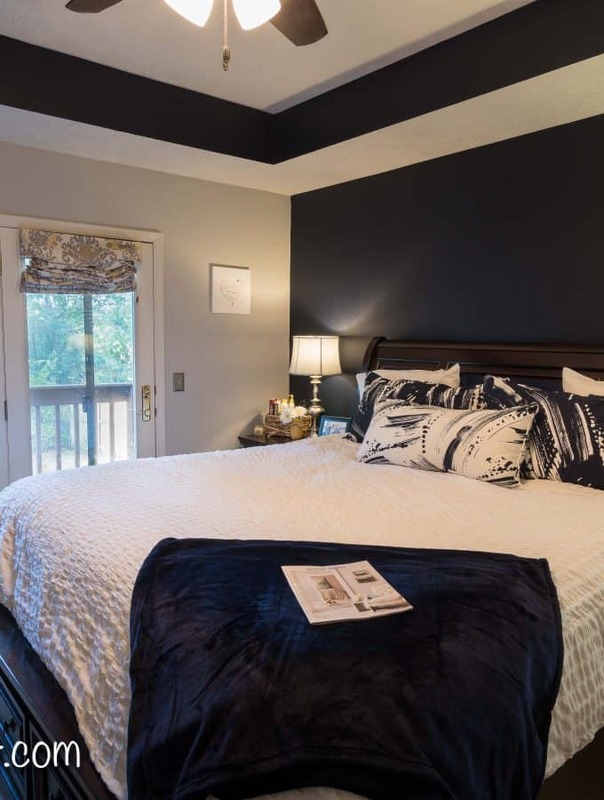 When I worked as a live in nanny for two years I only had my bedroom to decorate. It wasn’t a lot of space, but I wanted to decorate it for Christmas as best I could. 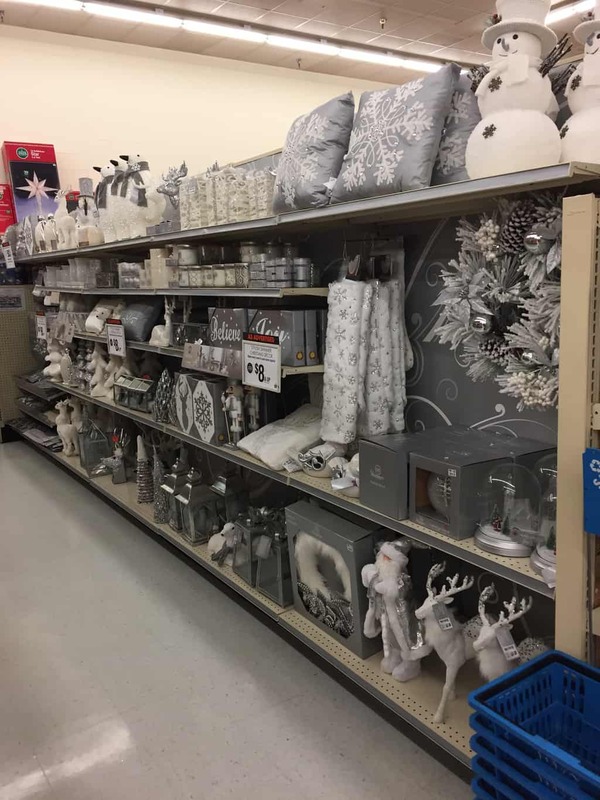 When we lived down in south Georgia I discovered Big Lots and it quickly became my go to store for Christmas decor. I loved all of the options they offered and went a little crazy my first year decorating on my own. The next year when Tyler and I were first married we had very little in the Christmas decor department, all he had was a little tree I had convinced him to get. So we headed to Big Lots and stocked up on everything you need to decorate for Christmas. After three Christmas’s in our second home together I had gotten a little tired of the same old decor every year. I knew I couldn’t replace everything but decided to give my mantle a new look this Christmas, so Tyler and I loaded up K and headed to Big Lots to check out their selection. When I saw the aisle filled with all things white and silver I knew it was the aisle for me. It was a departure from my traditional lean towards red and green, so I was excited to buy some new items. For me a mantle has to be about symmetry so my husband had the brilliant idea to lay out the items in the floor at Big Lots in order to see how everything would work out at home. We may have gotten some odd looks from some fellow shoppers, but it worked for me! I loved the silver tree and made it the centerpiece of the mantle. The candle holders with the snow and christmas trees on them were so cute they had to be included with some white candles inside. The other candles you see on the mantle are LED candles from Big Lots and are perfect to light up every night. 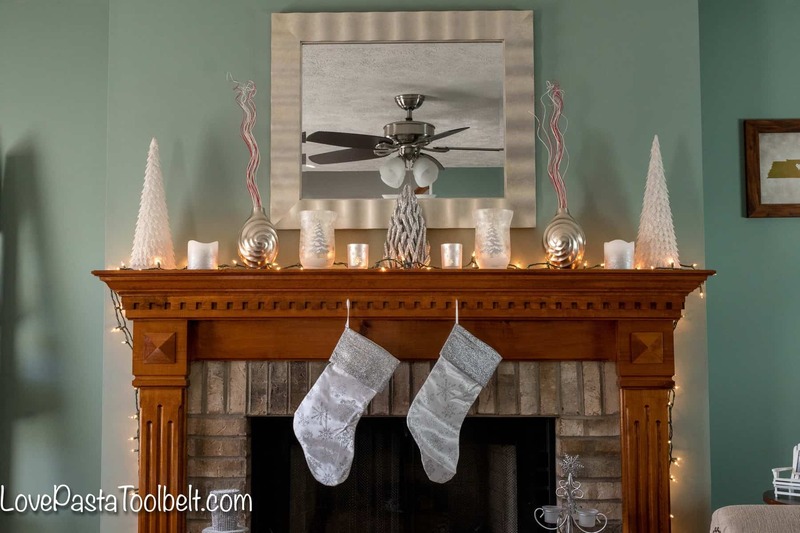 I already owned the silvery swirly vases, I got them from Big Lots when we first moved in, they fit in well with the scheme of the mantle so I kept them there for the Christmas look. I love the white tiered Christmas trees that we put at either end of the mantle. I like to have both tall and short things on my mantle and love the combination of both that we picked up. 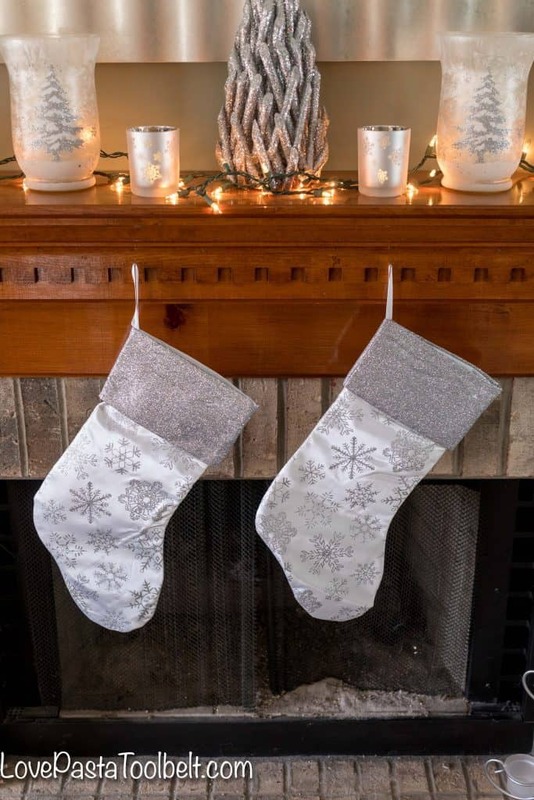 We also got matching stockings to our silver and white theme, although we’ll have to add another and another nail for K this year! And the cute little snowman was the perfect addition to the hearth to complete the look from Big Lots. The Christmas tree votive holder was something I already had that I’d received as a gift a few years ago. In my opinion no Christmas decorating can be complete without Christmas lights, so we of course had to add some to our mantle to complete the look. I’m loving how it turned out and I am looking forward to getting the rest of my house decorated! I’d love to hear what your favorite colors are to decorate with at Christmas? 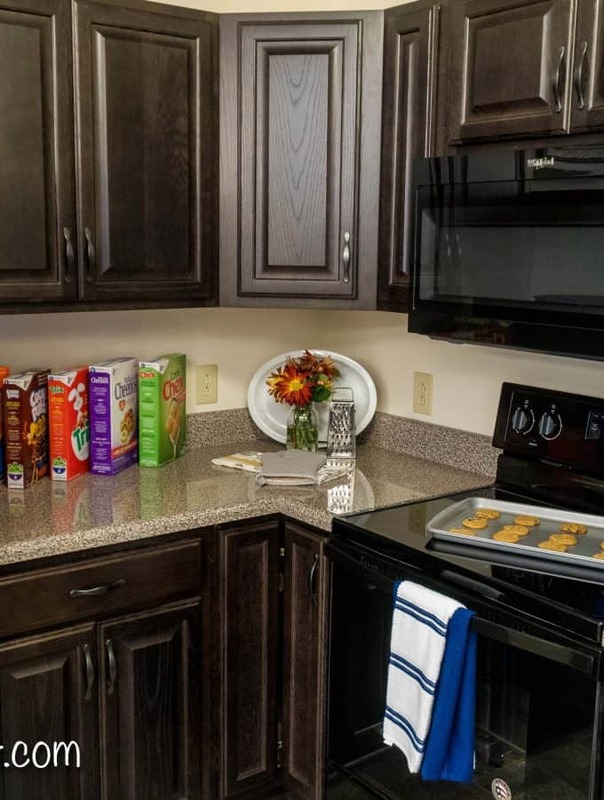 What great items have you picked up at Big Lots? Oh my goodness this is beautiful. I am heading to Big Lots today before everything is gone! Can’t wait to have a new mantle look this year. This is so cute! 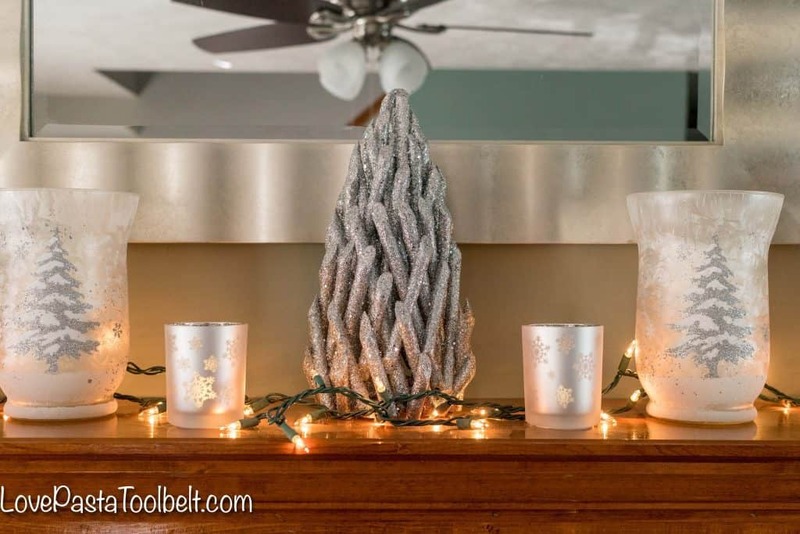 I love silver and white for Christmas decor! So pretty! This is so pretty and classy, What great classic color for Christmas. I can’t wait to get my stuff out! I love your mantle. I would be mesmerized each night and just stare at it. I have a tricky mantle to decorate. More later!! This is just gorgeous! 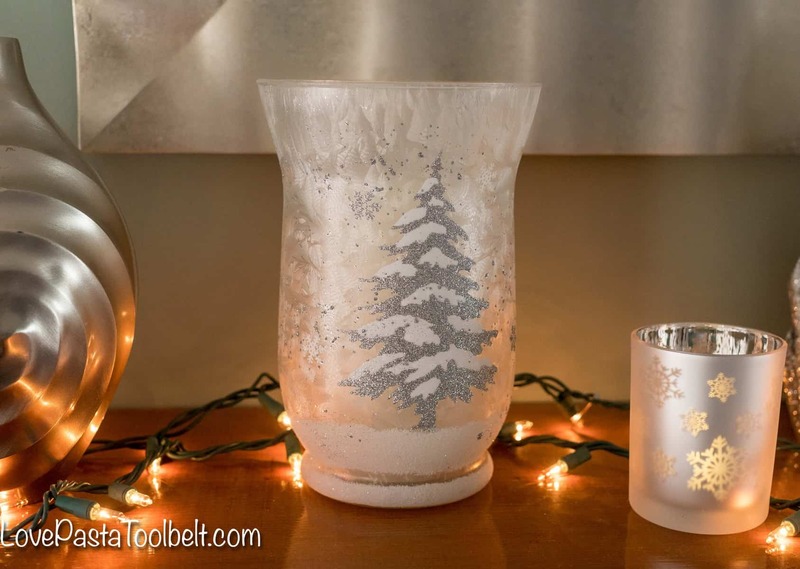 I love silver and white, what a great combo I’ve never thought of using for the holidays! Just lovely. This is so pretty! 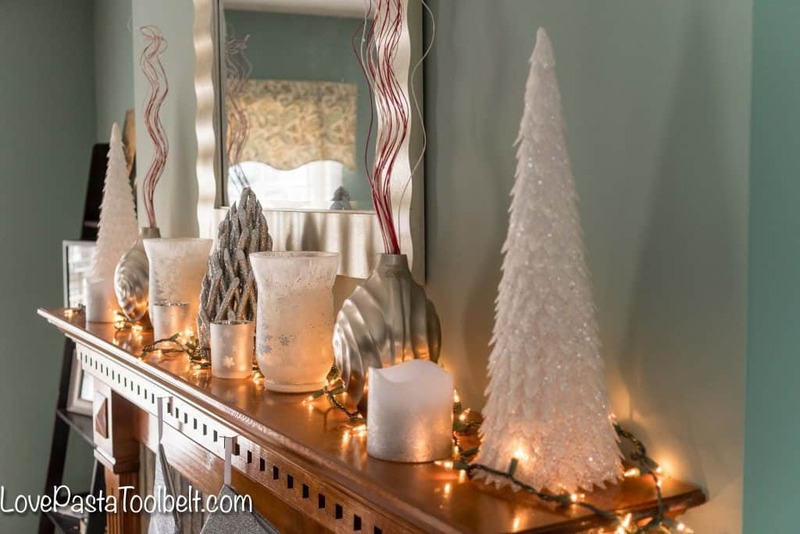 I love silver and white Christmas decoration but I always feel like I need the color so that is what we do. I have thought about decorating my bedroom in all silver and white and I think your mantle will be my inspiration. I am looking forward to breaking out the decorations soon! I love the holiday mantle. I love when its not Green and Red to make it too obviously its the “holidays” this looks more chic and sophisticated. We built a fireplace this year so I finally get to decorate a mantle! And these colors would look perfect in my house!! what a gorgeous mantle. I really like the color combo it pops with holiday cheer. 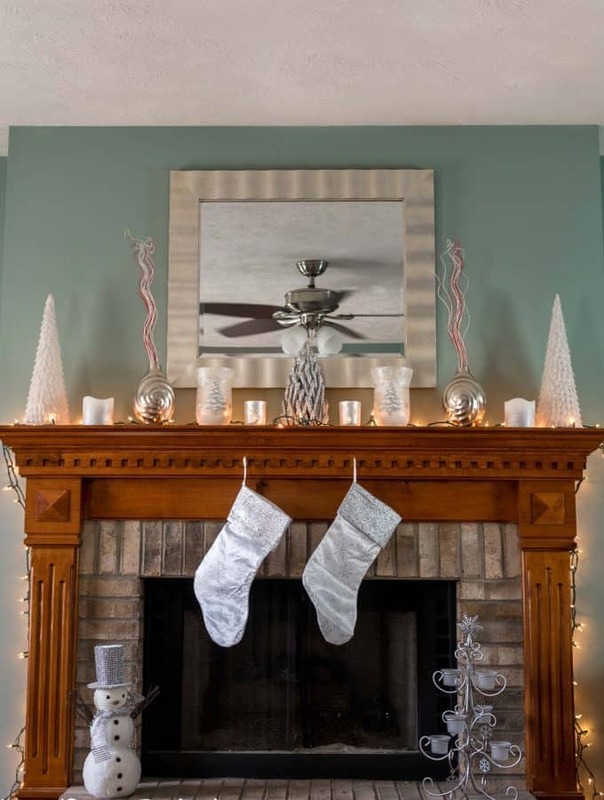 This mantle looks absolutely beautiful and really gets you into the holiday spirit. These are the perfect colors for the season and it is so modern and elegant. I am so jealous of people who have a mantel because they can make beautiful things like this! Love shopping at Big Lots. They have some great deals. 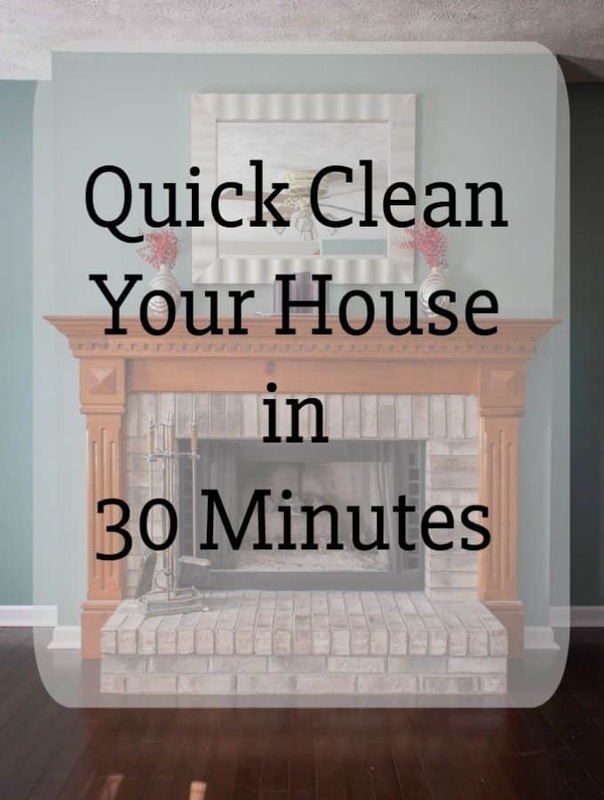 Your mantle looks just stunning! I’m such a sucker for metallics. Now I really wish I had a mantle even though I live in Florida. Haha! Omg how fabulous!!! I love big lots!!! We just went yesterday to buy Christmas decor for my daughters bedroom!!! Very pretty mantel. I love how simple it is but it makes a big impact. I like how it’s balanced too. This is top-notch. 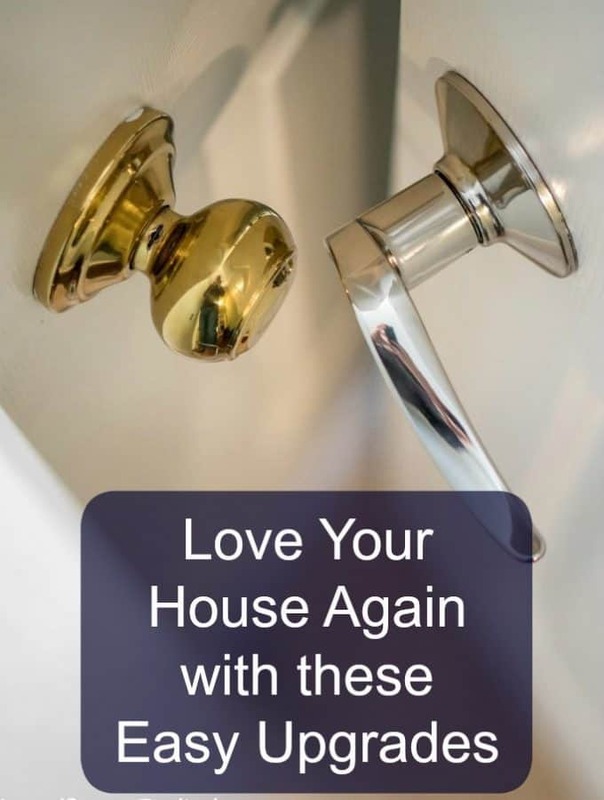 I love the decorative ideas. I love the color scheme. I love how gorgeous and elegant the silver and white looks. This is such a beautiful mantle for Christmas.